In this moment it appears increasingly clear that the growing levels of inequality and the tensions in national politics in the South African context are igniting a new era of post-Apartheid voices. These are the rising voices of a youth who are increasingly distrustful of “rainbow nation” doctrines and talk of neo-liberal racial democracy. In what has quickly become a historic wave of student-driven protests at the University of Cape Town, an unprecedented level of widespread debate, conversation, and tactical demonstrations have taken hold of the atmosphere and imagination of countless participants across the country and now across the globe. The protests focussed around the calls for the removal of a statue of the imperialist megalomaniac and renowned “philanthropist”, one Cecil John Rhodes. Rhodes was an avid businessman whose accumulated wealth stemmed largely from mining in Southern Africa, and he was also the colonial driver instigating the creation of the Rhodesian territory. The protest actions, since their inception, have demanded the removal of the statue along with firm commitments to address worker rights, curriculum and several other issues that have been laid out in full in a petition presented by students, workers, and staff. The real catalyst for the international attention was born from a controversial demonstration, in the second week of March 2015, beneath the figure of Cecil John Rhodes perched on his throne, gazing dreamily at the still vastly unequal city from his timeless ivory tower, the University of Cape Town. The demonstration, calling for the statue’s removal, reached its climax when one protester, Chumani Maxwele, threw a bucket of faecal matter over the statue. This spurred action and attracted a great deal of attention in both online and offline spaces. The responses varied from damning condemnations to overwhelming support and mass mobilisation resulting in marches, petitions, open letters and hundreds of opinion pieces in national popular media outlets in particular. On Friday the 20th of March, a procession under the banner of the slogan “Rhodes Must Fall” was led from the main campus down to the University administration building, Bremner, were the Vice Chancellor’s office is located. Midway through the address the student driven contingent occupied the administration building and took up residence in a historic room named the Archie Mafeje room. In 1968 this room was occupied by hundreds of students at the university protesting an intervention from the then South African government that sought to rescind Mafeje’s appointment to the African Studies department, as a senior lecturer. Archie Mafeje, hailing from Ncobo in the Eastern Cape of South Africa, had studied and taught at the University of Cape Town while engaging in political activism and providing insight into fighting for the plight of Africa and its people. He went on to teach and work at the University of Dar Es Salaam before moving to work in The Hague, before finally returning to South Africa to continue his work developing social science research in the South African context. Bremner building was quickly renamed by the student driven mass movement to “Azania House” invoking the spirit and legacies of the Black consciousness movements in South Africa in the 1970s. Azania house has become the center of operations for the social movement who have declared their unwillingness to move until the demands, particularly the removal of the statue, are met. On the evening of Tuesday the 24th of March in an address delivered by a cohort of black academics from the University of Cape Town, testimonials were given describing the difficulties around being a black staff member within the institution, and practical suggestions and dreams for “transformed” university spaces were shared in the lively, packed room, intermittently infused with protest songs and dances that served to raise spirits and refocus strength in the wake of the heaviness of the topic at hand. Consistently over the days that followed, the collective occupying Azania House orchestrated protests and performance art demonstrations across the campus, interrogating the legacy of colonialism and how it is memorialised on campus. 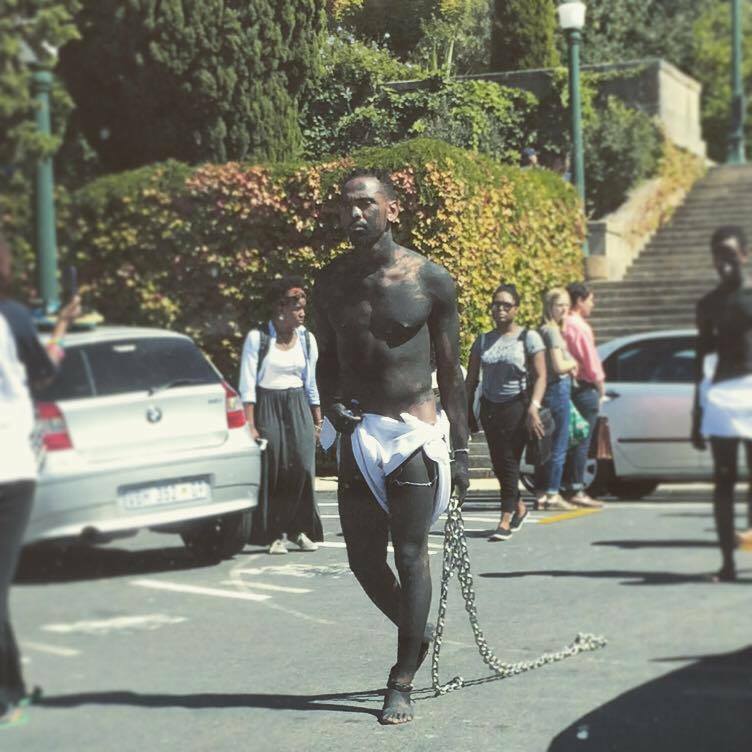 In a particularly powerful piece popularly titled Saartjie Baartman, a collective of artists left from Azania House and walked through the campus in chains, black paint and diapers, moving towards a sculpture on Baartman located in the University library. As the media attention, both national and international, continued to lock its gaze on the unrelenting “Rhodes Must Fall” campaign, the broader debates in and around the movement continued to drive for changes beyond the physical fall of the statue. Azania House, in the evenings that followed March 24th, has been home to guest lecturers presenting on various issues and the Archie Mafeje room in particular continues to be a space generating intellectual debate, art in various forms, and conversations regarding alternative educational pedagogies in ways that have been rarely seen on the University campus. These lectures and dialogues have provoked a conversation regarding changes in the curriculum of key interest areas within the University that have consistently marginalised Afro-centric views, thoughts and teachings. This was particularly discussed in the Politics, Psychology, English literature, Philosophy and History departments, respectively. Much debate surrounded revisiting the disagreements within the university that led to the departure of Professor Mahmood Mamdani in 1999, former AC Jordan chair of African Studies at the University of Cape Town and a world-renowned post colonial scholar. Dialogue on the conditions surrounding Mamdani’s departure, approached in his paper “Teaching African in Post-Apartheid South Africa”, has provided a useful, tangible foundation from which this movement can begin to address specific curriculum deficiencies, particularly emphasising on how issues centered around the African continent are dealt with. Another noteworthy trend stemming from the debates and conversations facilitated at the University has been the leadership shown by black women, and in many cases, black queer women. Several declarations and efforts have been made to ensure that the spaces and actions remain intersectional and develop through that lens going forward, which at present is no easy feat as issues continuously battle for priority. 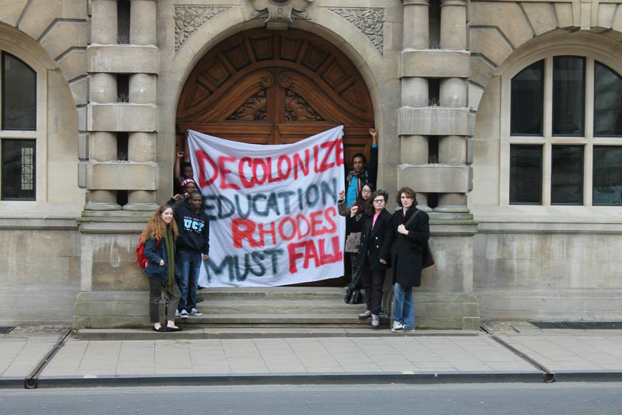 International solidarity from other Universities outside of South Africa continues to flurry in, notably kicked off with protest action at from a radical collective located in Oxford University calling for the fall of Rhodes and for the “Decolonisation” of education. The Black Student Union of the University of Berkley, California, issued a statement in solidarity and several other student groups in Universities in the region continue offer solidarity as the movement continues to pick up steam. Within South Africa, universities across the country have responded to the chants echoing from the University of Cape Town. Protest action in Rhodes University, located in the Eastern Cape of South Africa, has reinvigorated conversations around the existing institutional culture in these universities and drawn connections to the symbolic, continued, existence of names, statues and sculptures left over from the colonial and Apartheid eras of South Africa. Debate has ensued about how these artifacts and names reflect the continued exclusion of different epistemologies of thought, different races, classes and gender based oppressions. 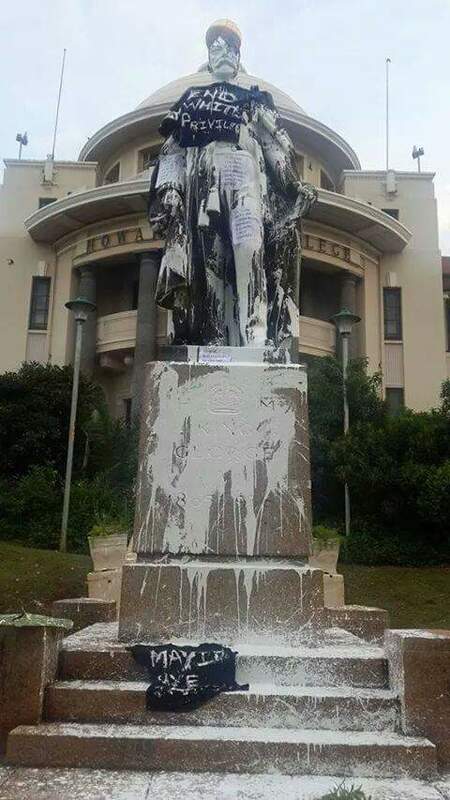 Notably, in Durban, at the University of Kwa-Zulu Natal, a statue of King George V has been defaced with paint as the ripples of anti-colonial rage continued to make waves on the East coast of South Africa. This campus, as with many university spaces in South Africa, is no stranger to protest, and this recent wave of student action locates itself within a broader conversation across the nation that seeks to apply pressure on the political imagination of the present day. The removal of the statue, while largely symbolic, has been an appropriate rallying cry by which to tangibly address the practical implications of so called “transformation”, redress and the re-imagination of what the role and function of an African University should be. The success of the removal of the statue will illustrate an important step in the ability for social movements under this banner to physically effect change in their environment. This process of physical change in the university space will begin to provide concrete, tactile shape to the intangible changes and transformations in Post-Apartheid South Africa. 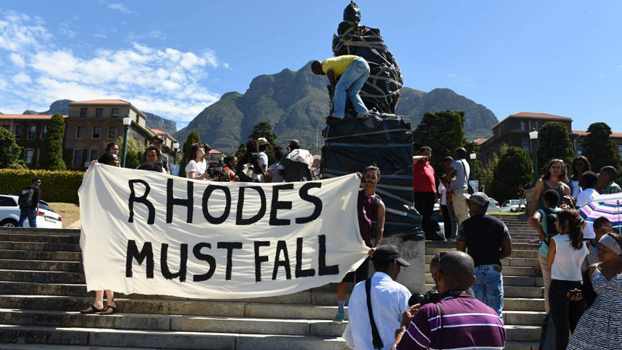 Indeed, several civil society organisations, notably the Marikana Support Group, and Equal Education have issued statements of support with the “Rhodes Must Fall” campaign, citing the need for critical introspection and declaring their rejection of the oppression and exfoliation that the legacy of Rhodes in many ways embodies. In the broader political climate of South Africa, leading up to the elections in early 2014 the country witnessed the rise of a new player in the political landscape, the Economic Freedom Fighters. The party locates itself as a radical, militant economic emancipatory movement whose political discourse lies squarely on the “left”. Their introduction has come at a time when the legacy of the “rainbow nation” project has begun to wane as the country grows increasingly vocal in its desire to improve basic services, infrastructure, and social mobility and reduce corruption and exploitation. The party, while controversial in its tactics and engagements, has injected energy into public discourse and popularised a language against inequality that has undoubtedly affected how many young South Africans are framing the understanding of our concerning levels of inequality. The series of protests, demonstrations and conversations that have been re-invoked with vigour allowing a revitalization of post-colonial thought and discourse into the popular public domain across South Africa, and more broadly across many countries at this moment, illustrate the fading dreams of miraculous peaceful transitions from colonies to independent states. Only time will tell whether this wave will give way to fatigue or grow and change into broader movements, and whether institutions and organisations will take these conversation to different levels of engagement. If we can be certain of one thing it is this: a change is going to come. Brian Kamanzi: Brian Kamanzi is a Cape Town-based spoken word poet and engineer by trade committed to the social upliftment of his fellow people. He is a budding Pan-Africanist eager to make contributions to the movement and form cross-cultural connections with others in the struggle.